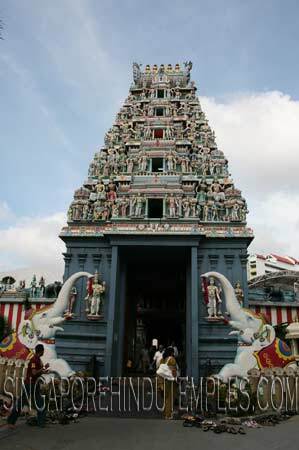 Sri Srinivasa Perumal Temple is located at 397 Serangoon Road. It is one of Singapore's earliest Hindu temples and is known for being the starting point for kavadi carriers during the Thaipusam festival. It was gazetted as a national monument on 10 November 1978. Perumal, or Lord Vishnu, has been the main deity in this temple. The land that the temple sits on was purchased from the government in the 1850s, but the temple was constructed only in the 1870s. A large pond and the mandapam or main hall were the main features of the original temple, known as Narasinga Perumal Kovil. The pond, which devotees used for cleansing, was filled up in the 1920s for health reasons. In 1907, the temple came under the administration of the Mohammedan and Hindu Endowments Board. In 1952, the Board decided that the temple should be reconstructed as it was in bad shape. Redevelopment began in 1961 and was fully completed in 1966, with much of it financed by P. Govindasamy Pillai, a prominent merchant and philanthropist who was a devotee of the temple. Craftsmen from South India were brought in to undertake the more intricate works. The wedding hall that later became synonymous with the temple was built as part of the redevelopment project. During this period, the temple was renamed Sri Srinivasa Perumal Temple. In 1977, construction began on the elaborate Gopuram or entrance tower, the most striking feature of the temple. Also financed by Pillai, the tower was completed in early 1979. The temple has since undergone further renovations and additions. Main deity worshipped in the temple is Perumal or lord Vishnu along with Andal, the goddess of beauty and Lakshmi, the goddess of wealth with a garuda vahana (sacred bird to Hindus.) Other temples include Brahma (the creator) temple and Shiva (the destroyer) temple. This is the temple of Krishna, embodiment of lord Vishnu. You will see his statues in the color of blue. Temple ceiling is beautifully designed and carved describing the nine planets of universe. In 1966, five tier Gopuram was constructed with the help of donation from P. Govindasamy Pillai. Entire temple is constructed in Dravidian architectural style.